Interior Intuitions features its own proprietary cabinet called Intuitive Cabinetry. 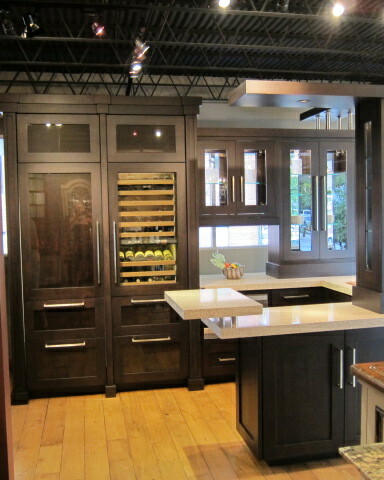 Trademarked and developed from the need for design built cabinetry, Intuitive cabinetry "knows what you want." This is our private labeled line, offering any finish, in any combination, and in any type of construction. The only limit is your imagination. Capture the feel of the 18th century palatial European estates and the style of the French countryside through embellishments and moldings styled by Mapleridge Cabinetry. As the original outsource for the Habersham kitchen bath products, Mapleridge designs are the ultimate in folk art, hand-painted detail and romantic styling. We invite you to add luxury to your home with this affordable option. 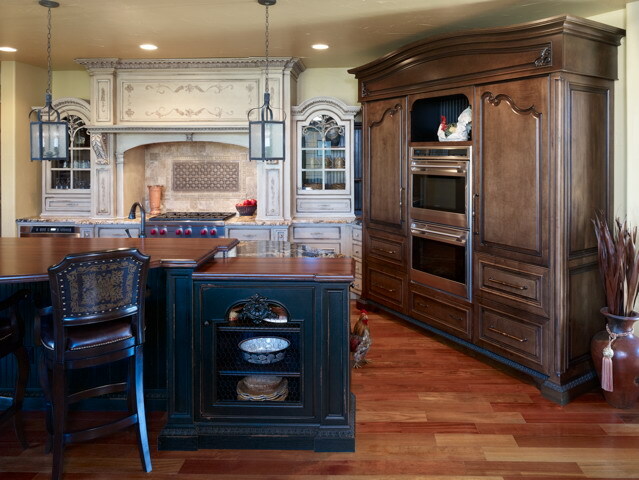 Trademarked and developed by Bev Adams, our Intuitive Cabinetry 'knows what you want.' Our exclusive line of cabinetry comes in any finish and in any configuration to customize any space and match any style. The only limit is your imagination. Intuitive Cabinetry goes beyond simply storage. Each piece of our design symbolizes a level of consciousness, together providing a natural functionality paired with ease. As the strong, sturdy foundation for each other layer, base cabinets provide storage for the tools of one’s daily preparation. They are the subconscious mind, the dense purple representing deep, concentrated thoughts – the intensity and solidity of the mind. The cabinet is a solid, dominant rectangular shape, balanced symmetrically on two sides. This balance represents the male/female, the yin and yang of life. The next layer is the countertop, the conscious mind. Made of zodiac, an acrylic material containing a blend of glass, mirror, crystals and natural stone, the countertop layer represents all the particles of emotions and addictions that influence one’s day. It is smooth, continuous, even, allowing endless opportunities for a change in direction. Next, the ego is embodied in the wall cabinets. This layer sits in the conscious mind, the countertops. The countertops give foundation to the wall cabinets, just as the conscious mind does for the ego. All visible sides are glass, thus transparent and reflective as the ego. Double entry doors provide escape. Inside the wall cabinets, an object creates an image, an impression seen from all sides. The fly-over crown, lid and shelves symbolize the super-conscious, intuition or soul. The fly-over shelves provide light to the conscious mind below and align the same shape. This signifies protection from the higher-self and from whatever divinity is. The suspension of these shelves allows for balance and is connected by steel up stands supporting higher levels of thought. The shelves cocoon the display, providing a sense of protection. Finally, the subzero armoire represents the Mother-Father. Tall and strong, these two pieces are identical in size yet diverse in texture. The refrigerator center panel is bronze glass over Bubinga Pommele veneer. The center of this is to blend with the wine cooler glass. Glass represents water, the sustainment of life. These two pieces are designed to reflect similar functions of food and wine preservation. The mother-father archetype represents protection, preservation and sustainability. Separately, each piece of Intuitive Cabinetry represents a level of consciousness, yet together they create an overall understanding, unity and holistic design for your kitchen. When you take your evenly-cooked salmon off of the heat of your new induction cooktop and pull a bottle of crisp chardonnay from your temperature-controlled wine storage unit, you will experience the lifestyle upgrade of a kitchen brought to you by Interior Intuitions. 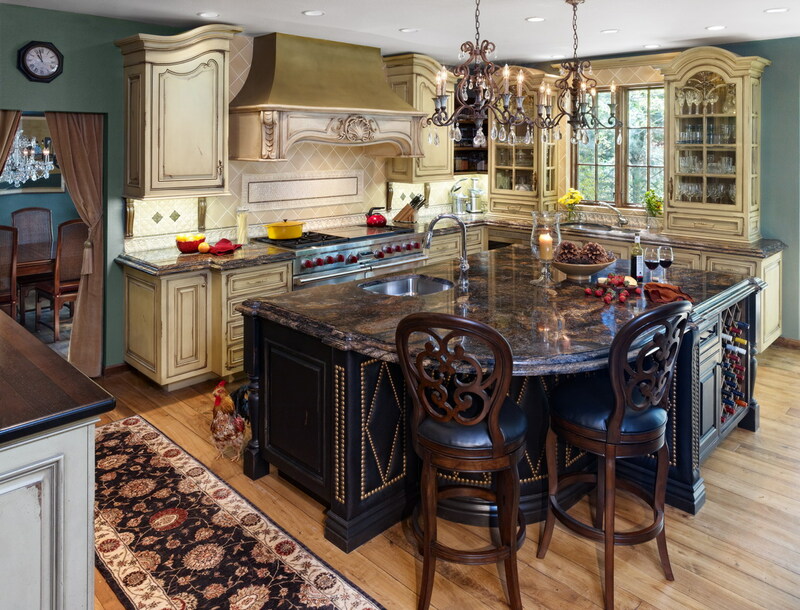 We are an authorized Sub-Zero and Wolf appliance dealer, rounding out our comprehensive design services with access to the finest appliances on the market today. The Sub-Zero line represents quality. Extensively tested cooling units—free-standing and built-in refrigerators, integrated refrigeration, under-counter refrigeration and wine storage—introduce convenience and style into your overall kitchen plan. Fuel your culinary potential with Wolf appliances including built-in ovens, electric cooktops, induction cooktops, gas cooktops, dual fuel ranges, integrated modules, microwaves, warming drawers, outdoor grills and ventilation. Wolf stands for dependability and performance you can count on. Interior Intuitions’ signature designs are synergistic, overlaying grand design with harmony and balance. Personal design extends to every detail. When it comes to countertops, you may desire to cater to your tactile sensibilities with textured countertop like granite, limestone, marble, slate or sandstone. Or if you are looking for similar durability in a smooth and solid surface, opt for Corian, Zodiaq and Silestone. For those smooth surfaces in particular, or any counter area allocated to high-frequency chopping, wood butcher blocks made of exotic woods are available to complement and protect the surface. If reflecting yourself in the mirror-like sheen of stainless steel or copper is more suitable, stick to shiny. The cool modernity echoed in our concrete surfaces offer yet another style option. And many of our clients are impressed by the variety of literally hundreds of color and pattern options high-pressure laminate provides. For a practical and eye-catching backsplash, explore natural stone, porcelain and ceramic. Countertops offer so much more than a place to set groceries—let us help you find the perfect decorative flair. If there’s one room in the house you retreat to, it’s the bathroom. So why not make yours into the ideal retreat? Interior Intuitions incorporates every consideration into a bathroom design that’s ideal for the way you live. Lighting that doesn’t cast shadows as you’re trying to apply mascara, heated floor tiles to spare you the chill that an ordinary bathroom tile will, countertops set just a few inches higher so that tall men don’t have to stoop over the sink to shave…these are the kinds of thoughtful details that add up to a remarkable bathroom. At the centerpiece of exceptional bathroom design are the fixtures. Showers and bathtubs come in endless styles and options. Toilets and bidets, washbasins and vanities, steam showers and soaking tubs offer spa-like amenities as well as being stylish necessities. Interior Intuitions specifies fixtures for your bathroom to satisfy your preferences. We vet a world of options to define the fixtures that fit our clients proportionally as well as aesthetically. From powder rooms to master suites, our bathroom designs are so genuinely inspirational that you’ll want to spend more time, not less, enjoying them. Shine a new light on your space and your style with creative lighting and decorative light fixtures. From the bold look of mounted ceiling fixtures to the understated warmth of recessed lighting, Interior Intuitions selects the perfect bright design. Many designers advise to begin at the floor and build the room around it. Flooring sets the tone of the room and the feel underfoot. Tile in natural stone, porcelain or ceramic lend to sleek, clean and crisp modern aesthetic and hardwood is a traditional favorite that is as homey as it is vintage and can match any style. Technology has re-written the American home, changing everything we thought we knew about how a kitchen or bathroom should look or should perform. Timers control every function from starting the coffee as the sun rises to dimming the lights once everyone’s gone to bed at night. Sound systems and computers are fixtures in every room in the house today, not just relegated to the living room or study. Systems and appliances start and stop intuitively. It’s as if the technology in your home does the thinking for you! Interior Intuitions kitchen and bath designs apply state-of-the-art technology to the rooms in your home to net the utmost in convenience because this isn’t just your address, it’s life your way.